Seats are general admission and first come, first served. Photos, book signings, and autographs only available at the meet & greet. 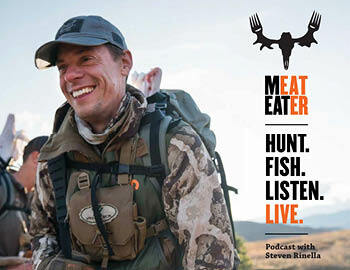 The MeatEater Podcast with Steven Rinella is the top-ranked outdoor podcast, covering hunting, fishing, wildlife conservation, and wild foods with intelligence, humor, irreverence, and plenty of unexpected viewpoints and surprising trivia. Steven and his guests are taking the show on the road for live experiences with members of the MeatEater community. Steven Rinella is the host of the Netflix Original series MeatEater and The MeatEater Podcast. He's also the author of six books dealing with wildlife, hunting, fishing and wild game cooking, including the bestselling MeatEater Fish and Game Cookbook: Recipes and Techniques for Every Hunter and Angler. Janis Putelis is the producer of the MeatEater TV show, a former elk hunting and fly fishing guide, and the founding member of the Rocky Mountain Squirrel Hunting Foundation.